Air conditioning is important both for residential as well commercial set ups. However, it needs to be noted here that there are differences between the two forms of air conditioning that is the commercial and residential air conditioning. One of the main reasons for such a difference is that in a commercial set up, the area that has to be cooled is a lot more than that of the area that requires cooling in a residential set up. Moreover, in a commercial set up, the number of people that occupies a particular area is also more in number. Hence, it is clear that for a commercial set up a highly powerful air conditioning system is needed. The most prominent difference between a commercial unit and a residential unit is the location. A commercial unit in most of the cases is located on a rooftop while the residential air conditioners are installed outside the building either behind or beside it. The commercial units are located on the rooftop so that they do not take up valuable interior space, does not create unnecessary sound pollution and there is no interference in the business when any sort of repair work goes on. 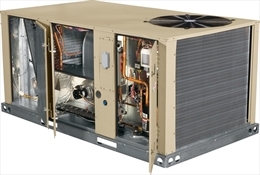 A commercial AC is generally a packaged unit while the residential ones are split. The commercial units are in one single package or within a cabinet. In this case only the ducts and the zone dampers are inside the house while the rest of the unit sits outside. On the other hand, the residential units which are split in nature have an outdoor unit and an indoor unit. 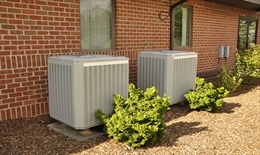 The indoor unit has the blower, the condensate drainage, and the evaporator, while the outdoor unit has the compressor, the condenser, and the condenser fan. The commercial units are modular in nature while the residential units are standalone structures. The residential units come as a single unit that cannot be expanded on requirement. In case, you require more cooling you will have to install a new unit altogether. While the commercial units come as modules to which extra heating or cooling units can be added as per requirement. It is an obvious thing that commercial air conditioning unit will be more complex in nature because they have to heat a larger area. Hence, the drainage system requires more parts than that of a commercial unit. The drainage system of a commercial unit is an elaborate one and there are also added components for the exhaust to function properly. On the contrary, residential units have a single condensation pan that drains to the outside of the building. Nevertheless, whether a residential or a commercial air conditioning system needs repair, you will have to call in an expert HVAC technician who has knowledge on that particular domain. In case, an amateur handles the unit more harm than good will be done. Lastly, in conclusion it can be said before buying a commercial or a residential unit proper research needs to be done along with guidance from an HVAC expert to get a unit that is most suitable for your requirement.